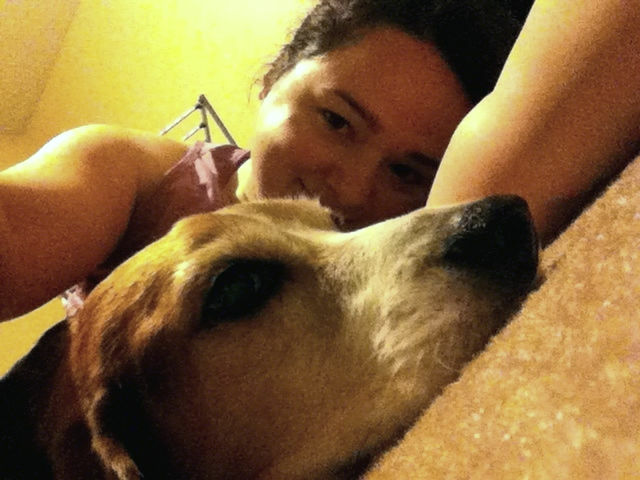 My first foray into home physical therapy on Monday night was a great success. It would have been much better had I had smaller weights. I used 5-pound weights for some of the exercises I’d used pulley weights for at my therapist’s, and it was really difficult after the first 20 seconds. This evening, for workout number two, I substituted soup cans. Like a BOSS. I’ll upgrade to real tiny weights next time I get myself to a Target. So this is a view of my gym equipment, cobbled together from an assemblage of things I’ve owned for several years (the lovely dumbbells) and things I picked up on sale lately. 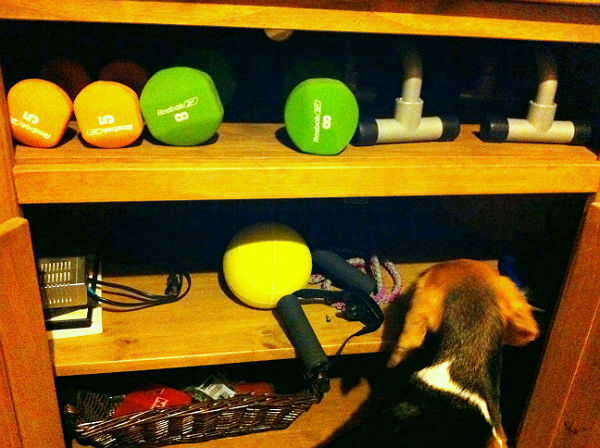 Home physical therapy gym (the beagle is kind of a dumbbell but not technically a part of the gym). The only thing not included in this shot is the horribly plastic-smelling bright pink balance ball that’s sitting on the back porch till the plastic odor is gone. Judging from how long my hands smelled like my new steering wheel cover versus how long I’ve had it, this may be a multiple-week airing-out or need to involve a cleaning product to speed the process along. I’ve also got a heating/cooling pack that we got a few years ago for my boyfriend’s various muscle pains, and after an hour in the freezer, it is doing a great job on the muscles in my shoulder. Two dogs and two cats pretty much follow me everywhere I go in the house. They watch me as I work out and sometimes try to play with the equipment as I’m using it. I have most of the equipment I need for a home workout and the dedication to keep at it. The best thing about my situation right now, however, is that I”m getting tangible results: since my trainer introduced that new stretch and urged me to really push myself, I feel stronger, I’ve slept on my healing shoulder, there is very little pain that isn’t preceded immediately by a workout… and the biggest surprise of all came in traffic while I was listening to music and started to dance around in the driver’s seat. I shrugged both my shoulders, and it didn’t hurt at all. It felt unusually normal. I haven’t been able to shrug my left shoulder without it hurting for at least a year. I was reminded of this limitation often because while talking to someone, usually at work, I’d talk with a lot of gestures and occasionally shrug without thinking about it, and I’d immediately feel a sharp, stabbing pain that made me cringe. When I found that I was able to shrug without consequences that afternoon, I felt incredibly happy and liberated. It’s probably the happiest I’ve ever felt while sitting in traffic in this city. It feels so great to be getting good results from my therapy, to know that I can get past this stupid injury and get on with my life, that I can go buy regular bras, dance to music without having to be so careful how I move my body, be able to raise both arms above my head in a straight line. I tried raising my arms today in the mirror. I’m not quite there yet. But I got my arm more straight than I did last week. It’s been a lot of work to get from the point where I thought my arm would be forever limited in use to the point where I know that sustained effort over a few months could well restore most of my shoulder’s function. Putting in the work has really paid off, and I plan to keep it up for as long as I must. This entry was posted in fitness, health and tagged Exercise, fitness, injury, Photos, physical therapy, Rehabilitation, results. Bookmark the permalink.